All objects with mass pull things towards their center, that pull is called gravity. The more massive an object is, the more its gravity “pulls” on other objects nearby. In space, the gravitational pull of large objects (like planets, stars, or galaxies) influence how other smaller objects like space shuttles, moons, and satellites move around them. Distance also matters— gravity gets weaker the farther apart objects are from one another. The orbiting of objects around one another in space is caused and maintained by gravity. Gravity is what keeps the moon orbiting around the Earth, and the planets (and other objects like comets and asteroids) in our solar system orbiting around the sun. Some orbits can be nearly circular, moving at a relatively constant speed, like Earth’s path around the sun. However, most orbits are at least slightly elliptical, taking oval pathways and moving at varying speeds depending on their proximity to large objects. In this activity, you’ll learn how to make scale drawings of solar system orbits, learn about a team of women engineers who launched a satellite mission to orbit Mars, and then plot your own path to another planet. You will define a scale for your orbit drawings and will have worksheets and animations to help you in your calculations. You can draw circular and elliptical orbits easily using a piece of string, paper, cardboard, and a couple of pushpins. Use this printable Scale Orbit Drawing Worksheet as you work. Use a pushpin, loop of string, and a pencil to draw a circle representing Earth’s orbit, with the center representing the sun. Next, use a ruler to draw a straight line from the center to the outside of the circle (the Earth’s orbital radius). Label the sun, Earth’s orbit, and Earth’s orbital radius in your diagram. 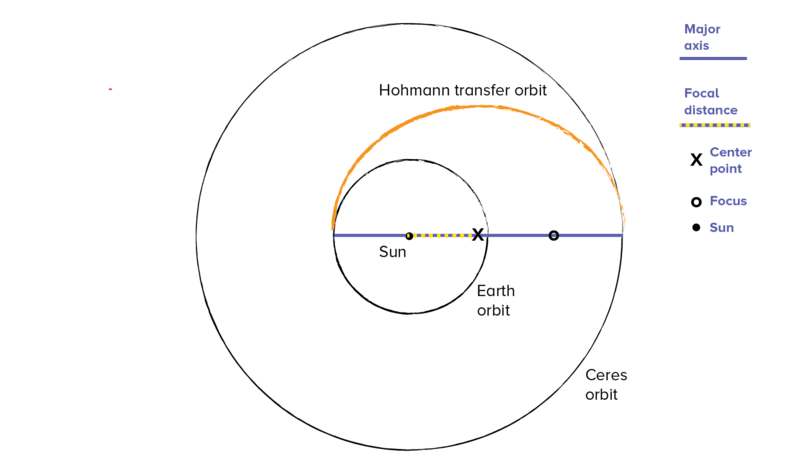 Use a ruler to measure Earth’s orbital radius in centimeters, which in real life is equivalent to one astronomical unit (1AU = Earth’s orbital radius). The scale of your drawing is a ratio that indicates precisely how small your drawing is compared to the real thing. In this case, the scale of your drawing is a ratio of the number of centimeters (cm) that represent one astronomical unit (AU). Many objects (like planets and asteroids) orbit our sun! Choose one or more other objects that orbit our sun (you can use this Orbit Guide to help you) and find the orbital radius of each. Multiply each orbital radius length (AU) by the scale of your drawing (cm/AU) to figure out how big to draw each orbit. Use the orbit lengths you calculated above to make new loops of string the length of each orbit, then add them to your drawing! For now, assume that all orbits are circular (even though most are elliptical), and make sure to use the sun as the center point, or focus, when you draw. How Do You Move Something From One Orbit To Another? A Hohmann Transfer! On November 5, 2013, India’s Space Research Organization, ISRO, launched a satellite into space to orbit Mars. Called the Mars Orbiter Mission (MOM), the orbiter was built in just six months on the smallest budget of any Mars mission before it. In spite of the tight turnaround and limited funds, MOM became the only successful first attempt by any space agency to orbit Mars. The orbiter arrived at the Red Planet on September 4, 2014 and represented a monumental accomplishment for India; it was a triumph of thrifty engineering and precise mathematical reasoning. The travel path that ISRO’s Mars orbiter took to reach the Red Planet was inspired by a maneuver described nearly a century earlier by Walter Hohmann, an architect whose hobby was celestial mechanics. Hohmann demonstrated mathematically that in many cases, the most efficient flight path between two different orbits was along an elliptical path from one side of the sun to the other, beginning and ending at each orbit’s furthest distance from the sun. 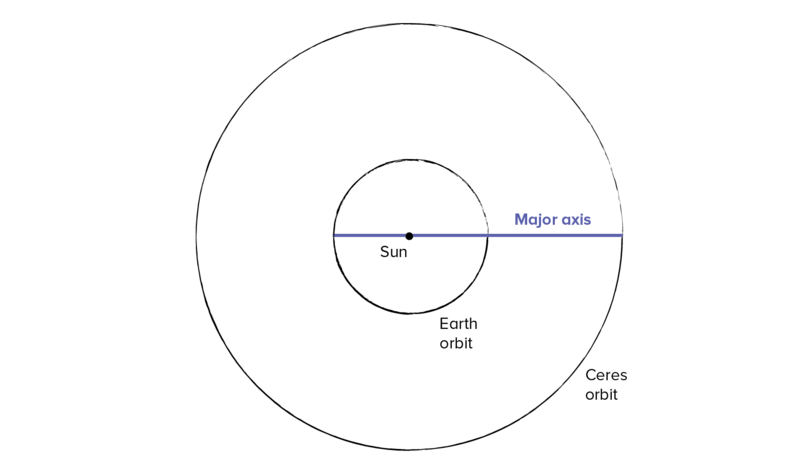 This elliptical spaceflight maneuver, now called the Hohmann transfer in Hohmann’s honor, uses the angular velocity of the earth’s orbit as well as the sun’s own gravity to “throw” a satellite into an elliptical orbit that intersects the orbit of the target planet. You can chart a Hohmann transfer like the one used by ISRO for the MOM mission using the same tools you used to create a scale drawing of solar system orbits, plus a little bonus math. You’ll have to assume that the orbits you want to travel between are circular (most solar system orbits are at least a little elliptical) and that they travel around our the sun on the same flat plane (in reality many do not). Relax, assumptions help simplify complex problems enough so that they can be reasonably understood and solved. Use this Hohmann Transfer Worksheet to help you as you go. Just like you did in the first half of this activity. Choose two orbits, calculate their scaled size, and draw them, making sure to label the sun, each orbit, and note the size of each orbital radius. 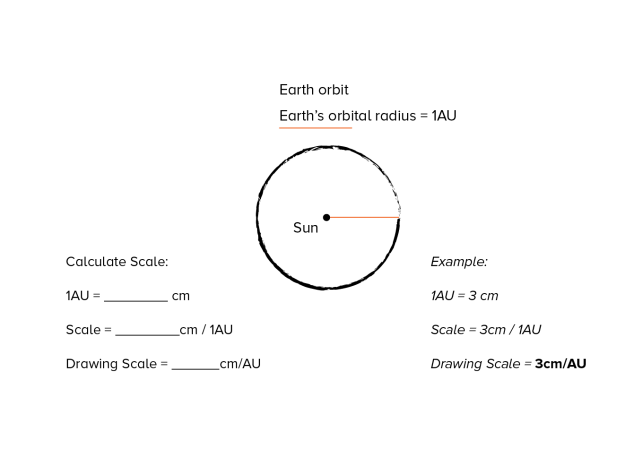 Ellipses have a unique property: every ellipse has two foci (foci is the plural of “focus”) along its major axis and the sum of the distance between any point on the path of the ellipse and the two foci is the same. This property is that enables us to draw an ellipse with just a single loop of string and two push pins. The sun is used as a focus to draw the Hohmann ellipse simply because the sun is the single most massive object in our solar system. Its gravity pulls a great deal on other objects that orbit or travel around it, including whatever object you transfer from one orbit to another. 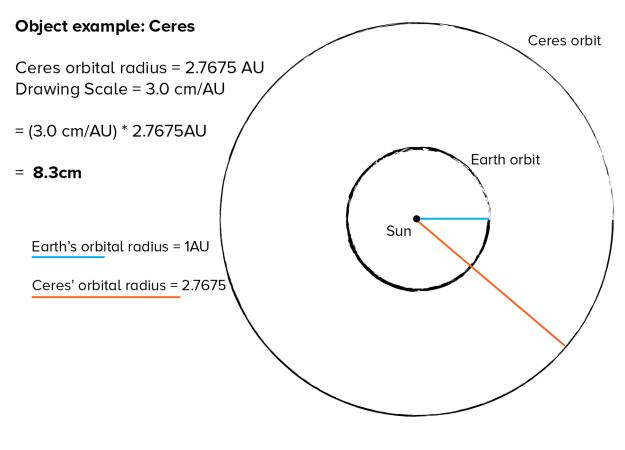 A second focus is needed to generate an elliptical path that spans the two orbits. Each focus is the same distance (called the focal distance) from the middle of the ellipse along the major axis. Place an “o” at the position of the second focus, located on the opposite side of the center point from the sun, one focal distance from the center point. 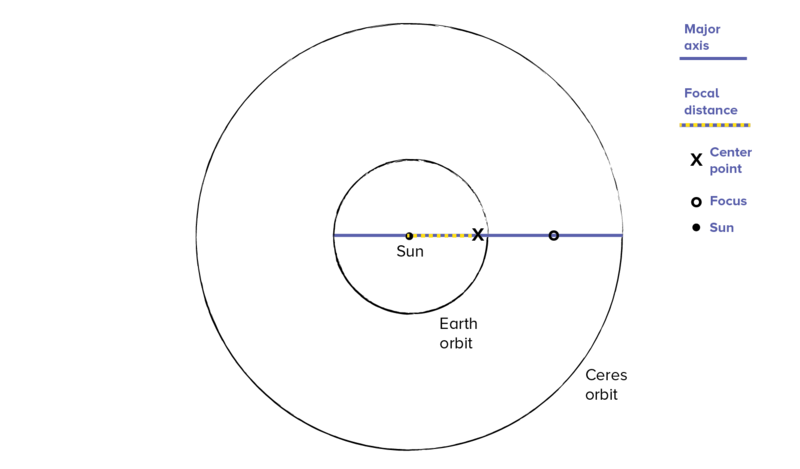 Convert all of the distances in your Hohmann transfer illustration to AU by dividing each distance (in cm) by the scale factor (in cm/AU) of your illustration that you calculated. You can keep track of the drawing measurements you made and their AU equivalents in this Hohmann Transfer Worksheet. 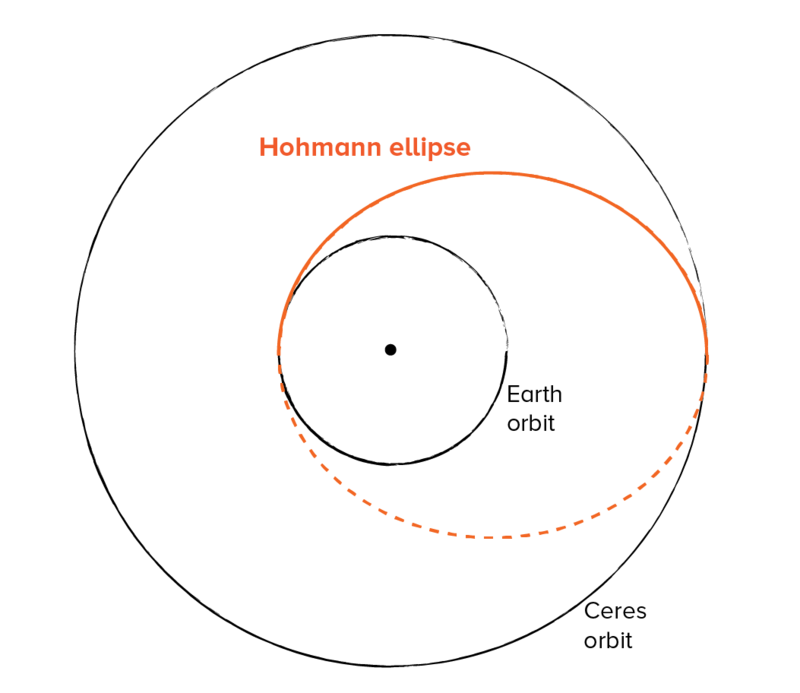 Erase or recolor the second half of your Hohmann transfer ellipse—a Hohmann transfer only goes halfway around the sun. Use scratch art to recreate your orbit diagram. Trace the orbits with glue and sprinkle with texture materials like colored sand. 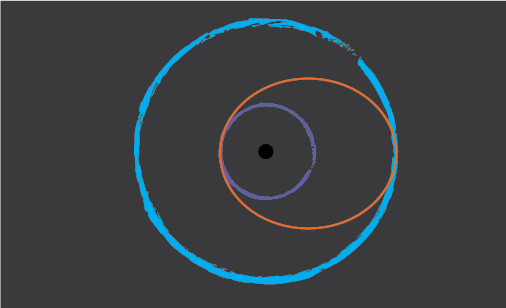 You can even use glow-in-the-dark markers to make your scale orbit and Hohmann illustrations into art! I’ve Got A Flight Path, Now What? How long will the journey take, and when should it leave? How does the gravity of a planet influence the size and shape of the satellite’s orbit when it arrives? What happens if you miscalculate? What if I want to become a rocket scientist right now?